In 1985 Mayfair Games unveiled the DC Heroes Role Playing Game. Given how comic fandom and gaming fandom tend to cross paths from time to time this seemed like a good idea. Marvel had put out a system through TSR a year before, which seemed to be fairly well received. DC Heroes had it’s share of players but from what I understand it wasn’t as good. I am not a gamer myself and have only played one or two RPGs in my lifetime so I am taking the word of friends of mine who either played or looked at Mayfair’s system and from what they tell me the structure of the game left a lot to be desired, particularly the way the stats and the gadget rules were laid out. However those that played the system told me that once you got around that a fun time could be had by all. A few years ago thanks to a good friend and some luck I managed to get my hands on both the original 1985 First Edition of the game (to go with a bunch of sourcebooks another friend gave me) and the 1989 Second Edition. Now despite having no real desire to start a campaign or the patience to teach myself the system I was excited to get both of them. They’re neat to look at and neat to own. I’ll get into the two Superman Sourcebook that Mayfair published in future posts but for today I thought it would be fun to go through both of the Editions that I own and see what Superman type stuff they contain. First up is the original box art from the first edition. You can really tell that this edition was released in the mid-eighties. The New Teen Titans are heavily featured right down to the “FEATURING THE NEW TEEN TITANS” logo. The New Teen Titans was DC’s hottest book at the time and had a pretty big fan base, so it makes sense that they would be prominently displayed. Then there’s John Stewart serving as Green Lantern on this cover. Around the mid-eighties Hal had given up being GL, so it’s kind of interesting that they would use John on this particular licensed product since other merchandise, like the Super Powers action figure line, had Hal and seemed only mildly interested in what was going on in the comics. Finally, you had the mid-eighties Brainiac ship in the background. I have such a nostalgic love for that design and yes I know that has a lot to do with the fact that I was into the Super Powers action figures while growing up. It would have been really awesome if they had made a skull ship toy. Apparently plans were drawn up for one as can be see HERE but, alas, it was not to be. You have to love the tag line for this edition. “Be Part of the Legend”. That’s almost as good as the Super Powers tag line, “Who wins? Who loses? You decide!” but doesn’t quite get there. Inside Superman gets some decent attention. He and the old school, eighties power armor Lex Luthor (another design I will forever dig on because of it’s association the Super Powers line) are featured on the cover of the Gamemaster’s Manual. He also gets the right hand side of the Game Master’s screen. Now that is classic, eighties Superman right there. They also had smaller, stand ups type cards as well. The second edition of DC Heroeshad a sleeker look to it. Gone was the George Perez group shot and in was a simple Superman/Batman shot. 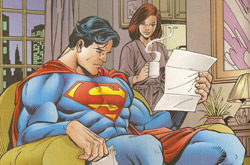 The Superman image looks to be the one from the Gamemaster’s Screen. Again, this isn’t my scan of the front of the box. There were far less graphics on the various books inside the box and it seemed as if Mayfair was going for a sleeker feel to the system. This edition also had the then up-to-date histories of the characters from the DCU. I kind of feel bad for Mayfair when it came to the original system. They had to put together all of that background material and right when they release the game DC goes and pulls a Crisis on Infinite Earths on them. Or maybe they couldn’t afford the rights to the graphics. It’s fifty-fifty either way, really. What this addition did have was trading cards…sort of. Instead of the boxy kind of cards from the previous editions they went with a simpler character image on one side, stats on the back approach. It was an interesting set, mainly because it included cards for characters from the Watchmen, which were kind of neat. I am kind of curious as to why they included Mr. Mxyzptlk. Maybe it had something to do with the fact that at the time Superman did not have any visually appealing villains. I mean they had to include Lex Luthor. That was kind of a given, but the rest of the Man of Steel’s rogues up to that point weren’t the most impressive in the looks department. Still, you have to give the Mayfair people props for including the imp from the Fifth Dimension. Sure he got some face time on the Super Friends and Super Powers animated series but other than that he was pretty obscure. In the next “thrilling” installment: the first Superman Sourcebook. Dude – I totally loved this RPG! I was in a campaign with this system for a few years with Ravenface and Race from The Unique Geek listserv. What made it really good was that it was leaps and bounds better than it’s main competitor, the Marvel RPG. Essentially, Mayfair took a long time to develop a very solid RPG system. Whereas TSR rapidly put together a shoddy product in order to beat DC to market. The smaller stand-up cards came with tiny plastic pieces. These were to be used in leui of metal miniatures. Even though the system was a bit complex, it was possibly the best superhero system around at the time. Ahhhh fond memories. I’m proud to say I’ve still got First, Second, and Third Edition of this system; along with a handful of sourcebooks and modules. I’m such a dork, they are still sitting on my bookshelf (after all these years!). The “World at War” sourcebook totally rocked! It was all WWII oriented and heavy on the golden age JSA (back before it was cool to be a JSA fan). The only thing I remember about that game is that it was possible for Batman to kill Superman without Kryptonite. Shag, you are the first person I have come across that had anything truly positive to say about this game as a gaming system. Most of the people really hated the way the system worked. I have the JSA book as well. Picked it up at a used book store years ago. I also have a ton of sourcebooks, including the Ambush Bug one which came with a cut out mask in the back. Loved the game. 🙂 Ran it for YEARS and had some really good times. The second edition was FAR better than the first (cracks me up that Brainiac is mispelled BRANiac, loves bran I guess, on the first edition character card). I never got the third (and final edition) as I was off designing my own game by then. Let’s go into a little more detail for those who have not played this awesome system. Yes, it is possible for Batman to kill Superman without Kryptonite, though extremely and I stress EXTREMELY unlikely. Let’s play out a round of combat, and assume that Superman missed Batman on the first round, (which isn’t likely) Batman now gets to take his turn and decides he wants to make killing attacks on Superman. Oh yeah, we’re gonna do this without hero points as a factor, because with them, the odds would be even more improbable for Batman. Batman attacks Superman, and uses his Dex of 9 to hit , and Martial Arts of 9 for effect. Batman needs to throw a critical attack and roll 21 (on 2d10, doubles stack and reroll) to even effect Supes, Alternatively, he could roll 24 without a critical for the same effect of 2 points on Superman. Lets say he went for the big hit and decided to devastate instead of critical. It gets harder to pull off, but at this point, what the hell, go for it. he would need a 28 to pull that off, and it would do a measly 6 points to Superman. For Batman to actually KO Superman, he would need to roll a 65, 70 to put him into 2 points of negative damage, (it would take 18 points of negative damage to kill him). Now, once we get into actual kill damage, Superman has 22 aps of invulnerability. Let’s say Batman actually rolls the 160 he needs to put Supes at -18, At the end of the round, Superman tolls his invulnerability of 22 vs 18 (his negative body) and whatever the result is would be damage that Superman heals. 22 against 18 straight up is 9, for which Superman only needs to roll a 7 on 2d10 added together. Now let’s look at it in a realistic tabletop scenario, with hero points. Lets say Batman actually did enough to put Superman at -18, for that kill check. A smart player would spend hero points on the AV/EV of the invulnerability check, and get back up with a few health, more on a better roll. The following round, superman would be stunned, but he could spend 1 hero point to make a recovery check, and be completely healed for the next round, wherein he would win initiative, and make a stain of Batman, who is lucky Superman doesn’t kill . So, yeah. I just wanted to clear this all up. You can say Batman can kill Superman, and yes, it’s true, but realistically, it’s not going to happen in any scenario you’ll ever see. ’twas an elegant, beautiful game which i still use. most who deride it either never actually used it or misunderstood, much as jeffrey with his bogus “batman can kill superman” remark. glad to see someone else pointed out what a crock that was. i think 2nd edition was the best as it had the factor costs and advantages rules, 3rd was just an unattractive package with minor revisions of 3nd. 1st was the most beautiful as far as packaging and presentation.